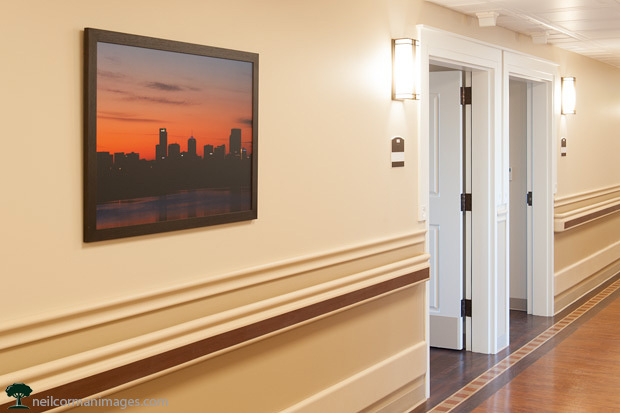 In December I completed a corporate art project for Sloans Lake Rehabilitation Center. 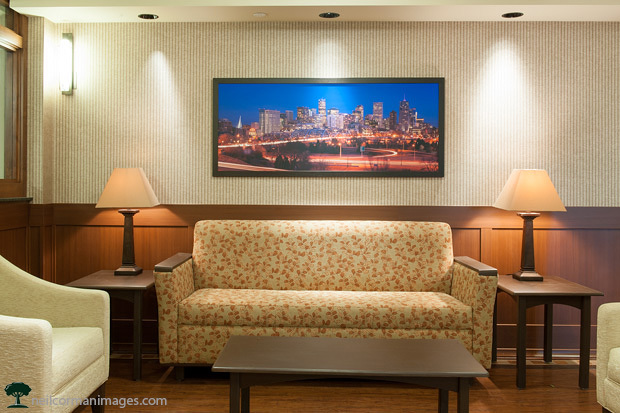 This project included sixty-two pieces of photography which are displayed across their two plus floors at the Sloans Lake Medical Building just west of downtown Denver. Sloans Lake Rehabilitation provides elevated healthcare through exceptional service to those needing post acute rehabilitation. 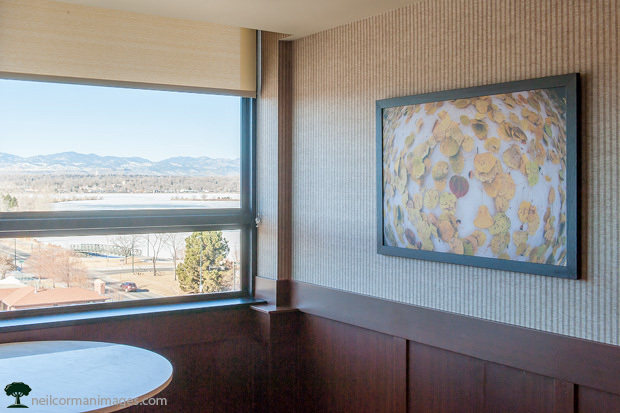 I worked with the staff to select the images for the location and we decided to tie in the amazing views from their top two of the building featuring downtown Denver, Sloans Lake as well as the Rocky Mountains. With just under four weeks to complete this corporate art project the whole team worked together to select, print, mount and frame the images and deliver the final work ahead of schedule. 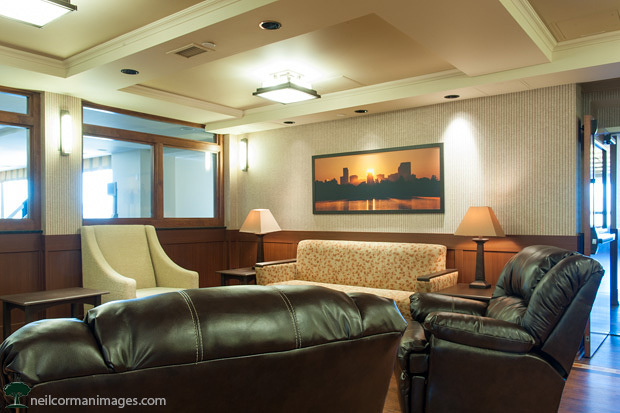 Building on the location, the artwork in the sitting area on the sixth floor is an image of Denver Colorado in the evening. This is similar to the view from the patient rooms on the east side of the building. In the corridor artwork is visible throughout the facility featuring images of Denver, Sloans Lake and the Rocky Mountains. 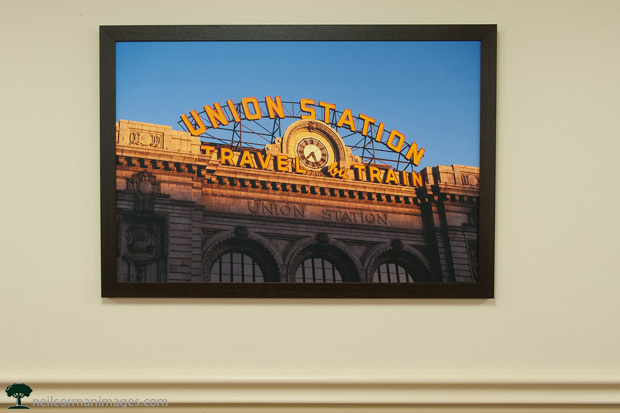 This image is of Union Station in lower downtown. In the corridor artwork is visible throughout the facility featuring images of Denver, Sloans Lake and the Rocky Mountains. This image is of Sloans Lake in the pre-dawn hours. There are forty-two patient rooms at the healthcare facility and each room has a piece of artwork. The rooms which face the mountains have an image of the city as in this room. Those rooms facing Denver having a mountain scene. 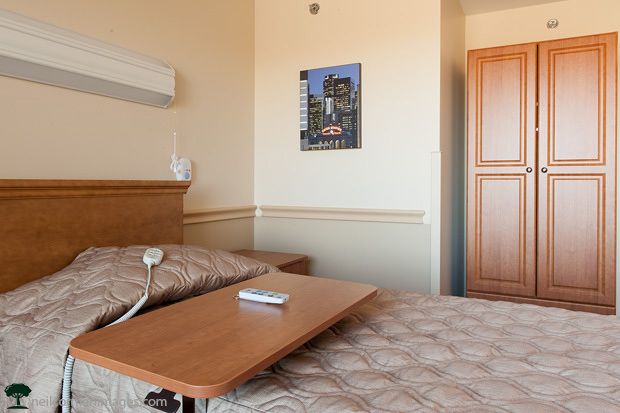 This allows the patients to have the best of both during their stay. Looking from the project site towards Sloans Lake and the Rocky Mountains in the distance. One of the first locations patients visit when checking in for an inpatient stay is the Admissions Office on the first floor. 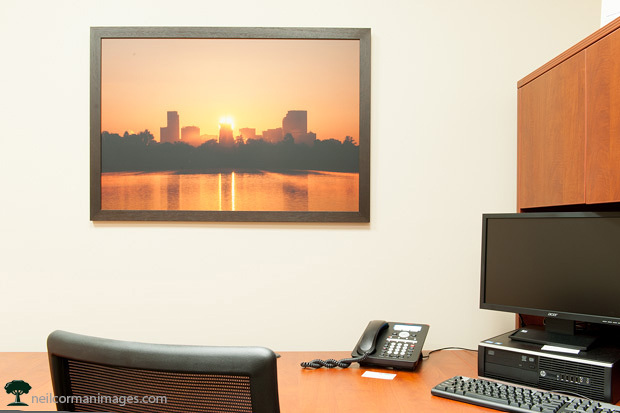 The artwork selected in this location as selected to match the panorama image of Sloans Lake on the fifth floor for consistency and to reinforce the location of the facility. Special thanks on this project for my partners to get this all together in a short time frame. Working along side me for this project was Metro Frame Works and Picture This Superior, both businesses in the Denver area.